It just wouldn't be a holiday without my mom preparing a pasta course, whether it precedes the turkey at Thanksgiving or follows antipasti at Easter. My mom's manicotti recipe (which comes from her Italian mother), feeds our immediate family of 40, but I've scaled it down to feed a smaller group of 6. 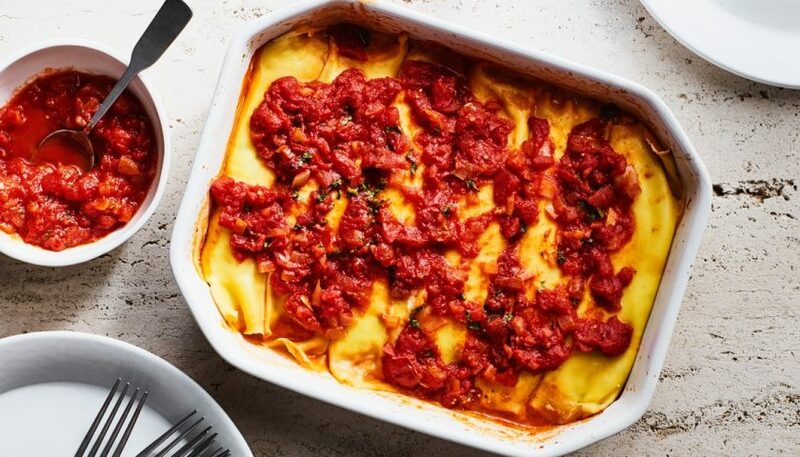 The tender manicotti wrappers are made by quickly cooking a batter to form a pastalike crêpe. Heat oil in a 5- to 6-quart heavy pot over moderately high heat until hot but not smoking, then sauté onion, stirring occasionally, until golden, about 6 minutes. Add garlic and sauté, stirring, until golden, about 1 minute. Add tomatoes with juice, water, sugar, and salt and simmer, uncovered, stirring occasionally, until thickened, about 30 minutes. Stir in basil and remove from heat. Break up eggs with a wooden spoon in a medium bowl and stir in water until combined (don't beat). Sift in flour and salt, then stir batter until just combined. Force through a medium-mesh sieve into another bowl. Lightly brush an 8-inch nonstick skillet with melted butter and heat over moderate heat until hot. Ladle about 1/4 cup batter into skillet, tilting and rotating skillet to coat bottom, then pour excess batter back into bowl. (If batter sets before skillet is coated, reduce heat slightly for next crêpe.) Cook until underside is just set and lightly browned, about 30 seconds, then invert crêpe onto a clean kitchen towel to cool completely. Make at least 11 more crêpes in same manner, brushing skillet with butter as needed and stacking crêpes in 3 piles. Stir together ricotta, eggs, Parmigiano-Reggiano, parsley, salt, and pepper. Cut mozzarella lengthwise into 1/4-inch-thick sticks. Spread 2 cups sauce in larger baking dish and 1 cup in smaller one. Arrange 1 crêpe, browned side up, on a work surface, then spread about 1/4 cup filling in a line across center and top with a mozzarella strip. Fold in sides to enclose filling, leaving ends open, and transfer, seam side down, to either baking dish. Fill 11 more crêpes in same manner, arranging snugly in 1 layer in both dishes (8 in larger dish and 4 in smaller). Spread 1 cup sauce over manicotti in larger dish and 1/2 cup in smaller dish. Tightly cover dishes with foil and bake until sauce is bubbling and filling is hot, 15 to 20 minutes. Serve remaining sauce on the side.